The Empire State Building is often described as an "iconic" structure. It has been featured in many films, videos, photographs, history books etc etc. There was even an imaginary giant gorilla who climbed it in the famous 1930's "King Kong" movie. However, the trust that controls the building lacks a moral compass as well as common sense. 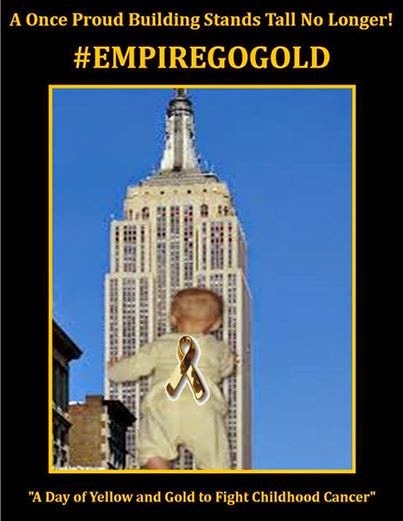 The powers that be at the Empire State building were petitioned to light the building gold to bring awareness for Childhood Cancer Awareness Month and responded with a NO. Despite pleas from city officials such as Councilman Vincent Gentile of Brooklyn, the owners of the building refused to budge. They did the same in 2010 when they refused to light the building in honor of Blessed Mother Teresa's 100th birthday. What's troubling is that they light the building in rainbow colors for Gay Pride week, the World Cup, the Lion King Broadway show; they light the building in the flag colors of other nations, an unknown Swedish electronic music group, made last minute lighting of blue for Democrats, and even green for the Teenage Mutant Ninja Turtles movie which is in theaters now. Yet they cannot find it in their hearts or mind to light the building gold for Children with Cancer! This is sickening indeed and shows the priorities of these building owners. I call on all with a heart and mind to boycott this building. Do not buy anything related to it, visit it, or even take photos of it. It is disturbing to think that these people find it difficult to light a building for children with Cancer. They obviously have an agenda that does not acknowledge religious figures nor the cause of children with Cancer. Luckily, other buildings lit up their facades in gold for Children with Cancer. If this building is ever attacked by terrorists and no one dies but the building falls instead, we will not miss it.